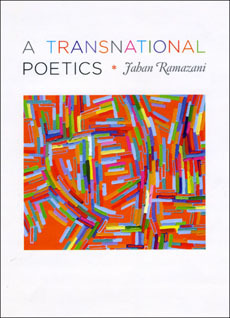 Jahan Ramazani, whose renown as a scholar of poetry is reflected in his editorship of The Norton Anthology of Modern and Contemporary Poetry as well as in his comparative studies of the modern elegy and postcolonial poetry, has produced in A Transnational Poetics a volume breathtaking in its global scope and critical incisiveness. The spectrum of issues and poets treated in this book is nothing short of stunning. Developing the study’s primary focus on the pervasive influences of transnationalism, Ramazani explores such topics as the effects of globalization on a range of modernist and contemporary poets; the ways in which stylistic devices serve to traverse geographic boundaries; the treatment of transnationalism in the poetry of mourning; the uses of Western modernism in exploring postcolonial hybridity; the response to technology and alienation by high modernist poets, poets of the Harlem Renaissance, and postcolonial poets; poetic reactions to decolonization on the part of both the colonizers and the colonized; and impressions of England in the eyes of black poets, both British and postcolonial, through the lens of African and Caribbean cultures. Ramazani illustrates these questions through the work of some thirty poets from the United States, the Caribbean, England, Ireland, Nigeria, Uganda, Hong Kong, and India. Ramazani’s central theme of transnationalism leads to innovative and elucidating connections that cross conventional boundaries of chronology and geography, such as the affinities between high modernism, which flourished in Europe and the U.S during the first half of the twentieth century, and postcolonial poets of the global South, who emerged after World War II in the wake of widespread decolonization. Given his enormous cross-cultural, cross-temporal breadth, it is all the more impressive that Ramazani is also adept at analyzing stylistic devices in individual poems—language, structure, imagery, voice, rhythm, allusion, and the like. Yet he grounds this analysis too in the writers’ transnational contexts. Ramazani’s observation about the work of Langston Hughes applies to his own study as well: both are informed by “an understanding of poetry as a discursive space that—by means of place-leaping lineation, cross-cultural symbols, and aesthetic hybridization—affords a remarkable freedom of movement and affiliative connection” (62-63). Whether on the global or the textual plane, Jahan Ramazani’s combination of multicultural erudition, keen insight, and critical ingenuity renders this book a masterful resource that will be consulted for decades.